Hakuba Mominoki hotel is a 4-star resort with an open-air onsen. You can take a plane, train, bus or car to get here. The best airport to fly arrive at is Narita Airport in Tokyo. From there, you have two main options to get to the hotel depending on your time constraints, budget and method of transportation. You can purchase a Japan Rail Pass, a flexible train ticket that can be used many times, upon arriving at the Narita Airport. The ticket is 20,000 yen and is valid for one month. The overnight luggage transfer to the hotel can also be arranged at the airport. The cost per bag is around 1,700 yen. Whatever method of transport you decide to take to Hakuba, you will initially need to take a train or bus from Narita Airport into Tokyo city, to arrive at one of the two the main transit points: Tokyo Station or Shinjuku Station. From the airport to Tokyo, the bus and the train both cost 3000 yen per person (1500 yen for children) into Tokyo, and take between 1 and 1.5 hours. There is an information desk with English speaking staff who can help you with buying train or bus tickets. Trains are called “Narita Express”. Buses are called “Friendly Airport Limousine”. Trains and buses leave the airport bound for Tokyo and Shinjuku every 20 minutes or so. There is no need to make reservations in advance. 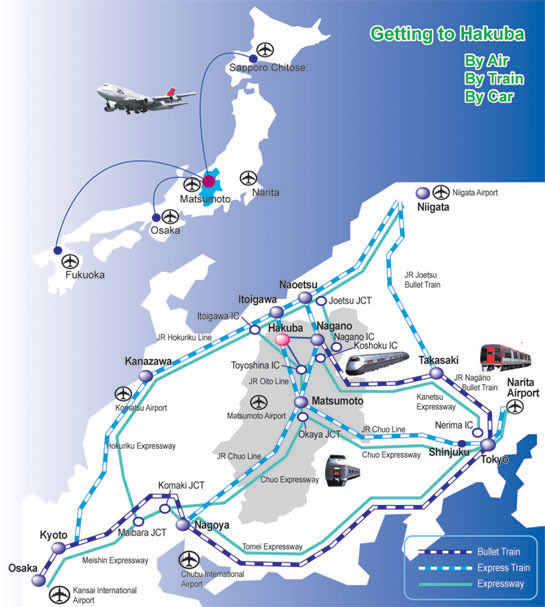 Option 1) By bus: Total 6-7 hours, 7,700 yen per person. Buses are cheaper but take longer. Option 2) By bullet train: 4 hours, 12,400 yen per person. Trains are more expensive but faster. b) You can then catch a bus from Shinjuku direct to Hakuba. This takes about 4.5 hours (sometimes slightly longer)and costs 4,700 per person. Bus Total: 6 ?? 7 hours, 7,700 yen per person (6,200 for children). b) Then catch a Shinkansen (Bullet train) to Nagano station, Asama Shinkansen line: 1.5 hours, 8,000 yen per person. a) c) Then catch a bus from Nagano station to Hakuba: 1 hour, 1,400 yen (700 for children). These depart every couple of hours. Train Total: 4 hours, 12,400 yen (10,200 yen for children). We can arrange for you to be picked up from Hakuba station. Please let us know in advance. You can also take a taxi from Hakuba station to the hotel (5 minutes, approximately 1,000 yen). Please rest assured there are English speaking staff at most train stations and, if all else fails, just saying “Hakuba station” will give the staff enough information to point you in the right direction or issue you with tickets. Hakuba Mominoki Hotel also has a heliport and provides an exective helicopter service. Please contact Mominoki Resort Inc. at 0261-72-4600 for the heliport information. We provide EV charge for electric cars. The price is 500 yen per 30 minute use. You can use it from 10 a.m. to 4 p.m. and from 10 p.m. to 4 a.m.
At Hakuba Mominoki Hotel we provide a heliport exclusively for our guests. Please contact us if you wish to use the heliport. We can also pick you up by helicopter directly from Tokyo metropolitan area or Narita airport. 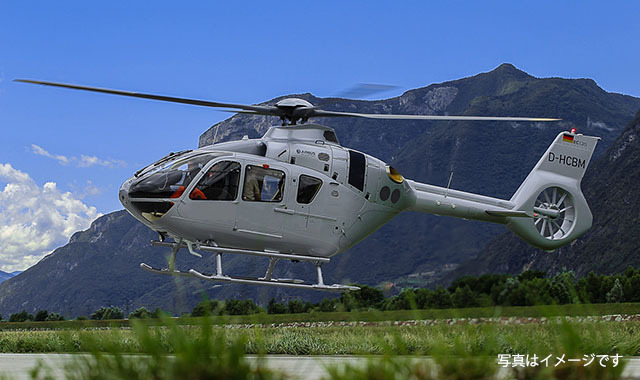 If you wish to book the helicopter, please make an advanced payment at least 1 week prior to departure and after confirming your booking, we will make organise the rest. Due to weather conditions and other circumstances the helicopter service can be stopped, in which case the cancellation fee will not be charged. If you wish to board in an area not indicated here, please contact us. You can also book the helicopter for a one-way trip. If you wish to go for a sightseeing flight by helicopter, please contact us.